For over 135 years, Mortimer’s Monumental Works Ltd has been creating everlasting monuments, grave markers, headstones and tributes to loved ones that are cherished to this day. Located in Victoria, we also serve clients from Vancouver and across Canada and the United States. From upright monuments weighing 9,000 lbs. for a family plot to a small 20 lb. cremation plot marker, all of our products receive our total attention to detail and exacting craftsmanship. Our experienced staff is ready to guide you through the selection of your tribute ensuring your monument complies with cemetery regulations and creates the lasting memory you desire. We have a variety of options available to fit every budget. 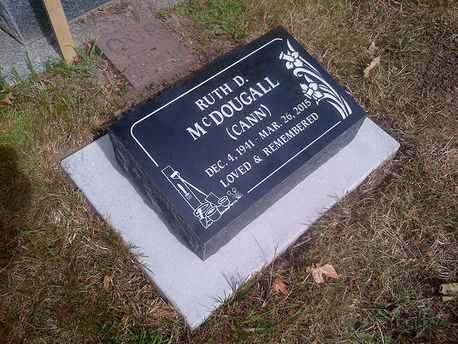 Our selection of headstone inscription ideas may help you get through this difficult time. A flat marker is a stone that is installed flat into the ground so the top surface is flush with the ground or grass. It can also be placed flat onto a pad or base that is set into the ground, leaving the marker fully on top of the ground. Many cemeteries insist that a marker must be flush into the ground, and this style meets that requirement. Flat markers are available in many sizes suitable for one or more people and can be made in many different colours. Pillow monuments are also markers that stand above the level of the grave, but they are lower in profile and different in shape from the upright. Pillow monuments are higher in the back than the front and slope to the front. The top is usually polished. Some pillow markers have all their sides polished, while others feature a polished front with the remaining sides and back being sawn smooth or rough pitched. 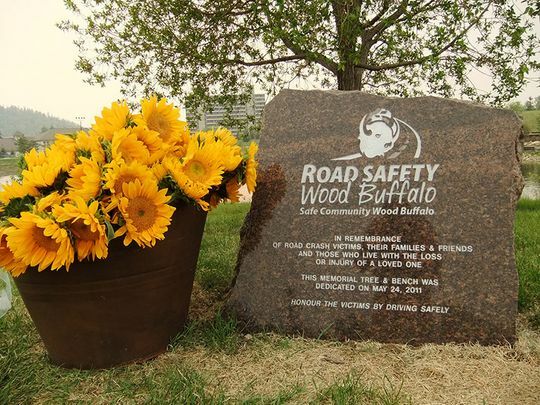 Because they sit above the ground, they can also be mounted upon a concrete pad or a granite base and can be created to memorialize one or more people. Upright monuments are grave markers that stand above the level of the grave. They can be any shape and size, are usually 6 to 8 inches thick and very often set onto a granite base. Common shapes are rectangular, heart designs, round and oval. They can be created from any colour granite we have available. An upright monument is an outstanding gravestone. With their larger size, there is greater opportunity to create a more personalized design for one person or many. 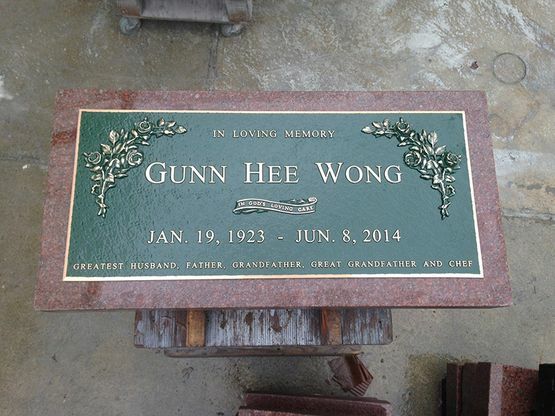 Bronze plaques are a beautiful alternative to traditional stone carved memorials. Typically mounted upon a granite base, bronze plaques, in sizes permitted by the cemeteries they are intended for, usually have set designs and borders that the foundry supplies. The design and lettering on every bronze memorial is hand-chased, highlighted and carefully polished. Each piece is finished in statuary bronze, the natural way, to maintain the warm hues unique to this wonderful metal. The final effect is stunning and to preserve this beauty, each bronze memorial is given an application of extremely durable clear finish. 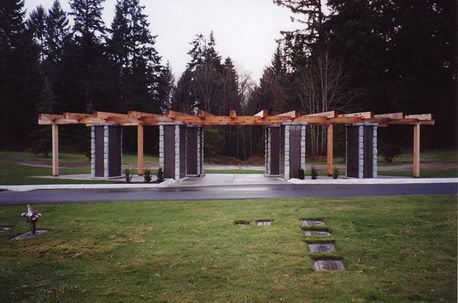 The name columbaria is derived from the Latin columba or "dovecote," the dove being the symbol of God's spirit and peace. A columbarium is a collection of niches designed to house urns. Inscribed with the person’s names and dates of birth and death, columbaria are constructed to serve as permanent structures in cemeteries, churchyards or within churches themselves. Today, many people are searching for an alternative to ground burial that offers beauty and simplicity. Memorialization within a columbarium is one such alternative. Mortimer’s has the expertise and experience to provide a wide variety of columbaria suitable to your needs. 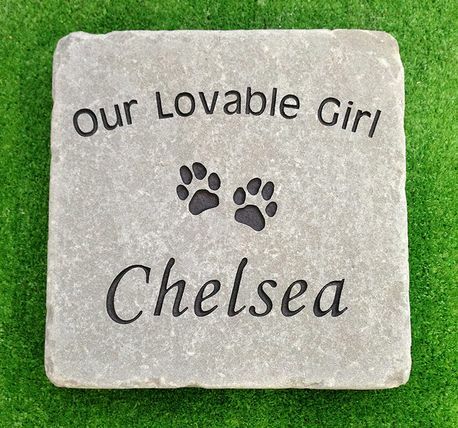 Whether you’re looking for a memorial made from river rocks that seamlessly blend in your garden or engraved granite headstones, we can fabricate all kinds of pet grave markers for your beloved family friend. Alternatives to the usual grave marker can be in the form of a cross, a natural boulder or benches. All of these items require approval by the cemetery they are intended for. 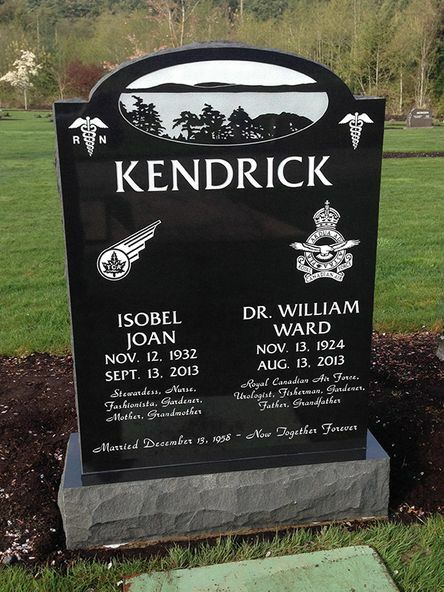 They can be engraved with names, dates, messages and graphics and be as attractive as a conventional gravestone. As well, the benches and boulders can be used in our non-cemetery settings. Sometimes cremated remains can be stored inside the piece securely and permanently. Crosses: We have many different styles of crosses to choose from in both granite and marble. Tree plaques: These small plaques are ideal for marking the dedication of a tree. 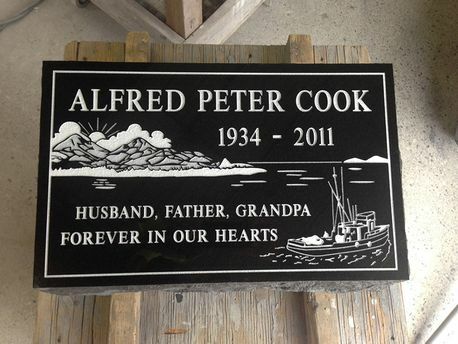 They are made on either a 4" x 6" or 6" x 10" black granite plate attached to a black granite post. Unique shapes: This category of grave markers covers stones that stand above ground but are non-traditional shapes. Natural boulders can be engraved to commemorate an individual. Columns, obelisks, crosses and benches are some of the shapes found in cemeteries and engraved with the name and dates of a loved one. Some of these shapes have bronze plaques attached to them, and the plaques have names and dates cast onto them. Because this category includes unconventional shapes and sizes, permission for use from the cemetery must be obtained. Vases: Vases are a beautiful way to accessorize an upright monument. Available in bronze and a wide variety of granite colours and finishes, vases placed at either or both ends of a granite base that the upright monument is attached to create a beautiful finishing touch. These rustic boulders come in many different styles, colors and shapes. The face of the boulder can be entirely polished or just have a round or square panel polished with a rough surface around it. There are many benefits to pre-arranging your grave markers. Planning ahead can eliminate any emotional mistakes as you can make the selection together to suit the specific taste and style while save money by avoiding inflation. Pre-arrangement allows you to take as much time necessary to complete the project. We have the portable tools necessary to allow us to complete stone lettering on-site without having to remove the memorial from the cemetery. Our portable equipment allows us to perform the lettering at the grave site, which will eliminate the risk of damages during transportation.